Over the years, my father has passed down an important family mantra of sorts: the best food comes from the shabbiest shacks. Birthed from decades of soul-searching amongst hosts of Korean noodle joints, this family motto proved to be particularly true back in the home Peninsula. Some of the best meals I’ve had by far in Korea were at five-table huts in the middle of reeking (in the best of ways) fish markets, many with no signs at all. You sit down, and a simple (time-tested and customer approved) menu is awkwardly hung on the wall. An elaborate menu is usually not needed, as these places are usually known for one or two specialty dishes. The food is direct, to the point, unpretentious. The flavors speak for themselves. The people are genuine, their hands speak of their years in the kitchen. Following this mantra, I was recently led to an Indian joint in the middle of somewhere in Arlington, VA. Somewhere on the border between Arlington and Falls Church maybe, somewhere between the yuppie part of town and the ethnic mixing bowl of Northern Virginia. I’ve always been fascinated by ethnic food, especially restaurants that are frequented by “locals”. Ever more so since working as a contributor for Roads & Kingdoms, my hunt has led me to remote corners of the DC suburbs, in the midst of the most vibrant of immigrant communities, basting in centuries of culinary excellence. Driving by without much thought, you would have missed the place, no doubt about that. 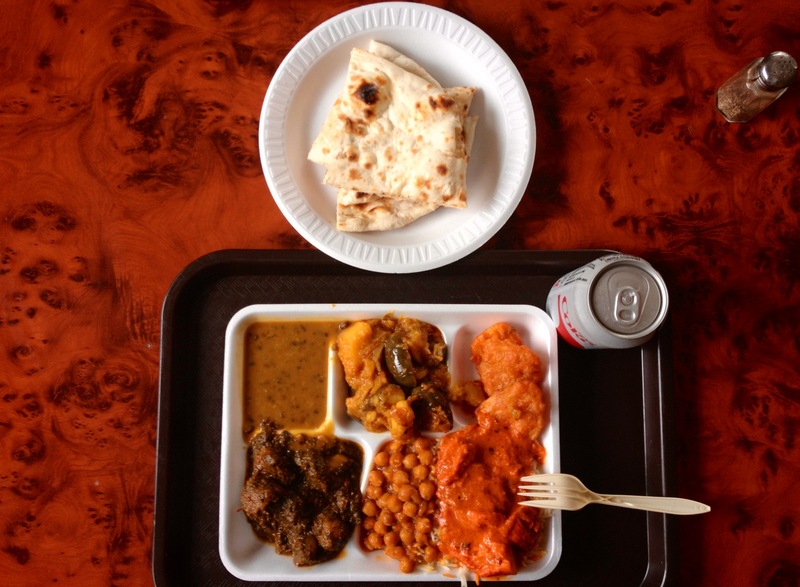 The red brick building rests upon a slab of concrete, and if it isn’t for a small sign that flashes “Kohinoor Dhaba Buffet”, there is no way you expected one of the best Indian establishments to come out of the place. There are five parking spaces in front of the building, and three of them are occupied. The place looks authentic enough (good sign), in the middle of nowhere, shady exterior, shadier interior, and a proprietor slash manager type who is eagerly determined to stop me from shooting his restaurant (good sign?). My imagination sparks, scribbling stories of Indian mafia(?) and their buffet joints. What could be going on in here? How odd, I think, while I stash my iPhone in my pocket, carefully eying the two other grumpy-looking men guarding the register. The buffet counter was six-feet long, packed with vibrant colors of orange, green, brown, and red. The odors were hypnotizing. Goat curry was thrashed generously onto my plate, along with two types of chicken curry, chick peas, and two more types of veggie curries for which I cannot recall the exact nomenclatures. The videography-resistant manager brings us a steaming plate of fresh naan. We walk up a narrow flight of stairs to another dining area, where an episode of the Judge Alex show is showing on a ancient TV set. Perfect, I thought, until a few other hungry Indian customers came and changed the channel to some Bollywood soap opera. In between spoonfuls of rice and goat, in between our exchanges of post-election politics, my friend and I curiously tuned into the soap opera (it had subtitles, after all). What an atmosphere. Quite the experience. As shady as this place was (I will probably never get the full story behind the no-filming gag), the food was spot on. My father’s mantra proved to be infallible even in the remote wilderness of NoVa. After plates of curried meats and fresh naan, my friend and I walk out, gastronomically stunned, always a good thing. We agree that this place is not the most girlfriend/wife-friendly establishment. Well, we correct ourselves, maybe once, for the food is worthy of the somewhat gloomy and ominous atmosphere. It could’ve been the weather, the dying trees and leaves and all that. With lingering notes of spices, we move forward, back to yuppie Arlington and its Northside Social, for a round of coffee.